As Diwali is advancing, the ‘say no to crackers’ campaign is also boosting up. There are multiple reasons to avoid crackers like concerns of global warming, increasing air and noise pollution, impact on child labor and so on. 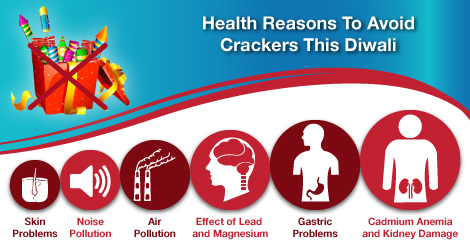 We are trying to contribute to this campaign by highlighting the impact of crackers on health. 1. Noise pollution: Sudden and extravagant sounds of fire crackers may increase the risk of heart problems like arrhythmia and high pulse rates. The anxiety created by lack of sleep due to noise pollution can deteriorate the health of patients with chronic conditions like blood pressure and diabetes. The loud sounds can affect the babies in mother’s womb and also the pregnant mothers. Exposure of loud and sudden explosion can cause hearing impairment in infants. 2. Air pollution: The fumes generated by bursting crackers can act as allergen for asthmatic patient and can trigger an asthmatic attack. The fumes can also lead to respiratory problems like coughing and wheezing. Chemical pneumonia, though a rare condition, can develop due to the fumes from fire crackers. 3. Gastric problems: The chemical in fire crackers often stick on the hands of the user. If not washed properly, these chemical can enter your body with food and can lead to serious gastric troubles like vomiting, diarrhea, dehydration, and allergic polyp in the intestinal tract. 4. Cadmium anemia and kidney damage: Cadmium found in the fire crackers is very harmful for the blood cells. The element breaks down the healthy blood cells and prevents formation of new ones. It also reduces the uptake of iron by the red blood cells and thus leads to anemia. The accidental intake of cadmium can lead to kidney toxicity severely and unfortunately the kidney damage thus developed is irreversible. 5. Effect of lead and magnesium: Lead present in fire crackers can cause nervous damage and thus render the user prone to paralysis or even coma. Magnesium can lead to metal fume fever. 6. Skin problems: The chemical in the crackers are very acidic or alkaline in their pH and thus can damage skin. Sodium present in the crackers reacts vigorously with moisture and can damage the skin. All these problems are very common in the children working in the cracker factories. Please avoid these little devils not just for the sake of your health but also for these children who are losing their health and even their lives.